When I went home last year I heard so much about this baked rice but I didn't have a chance to try it. 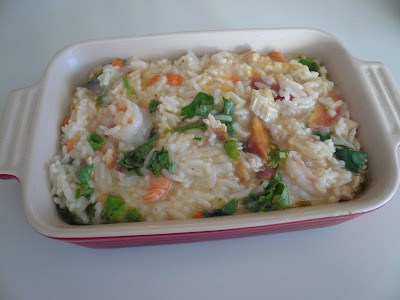 Since I have some leftover rice, some roast chicken I thought maybe I can do my version of the bake rice. Is easy and you can use any leftovers from your fridge and with some grated cheese you can have a quick meal in half an hour. 1) Heat some oil in a pan and saute the garlic , onions and carrots until soft. 2) Add in chicken, shrimp and tomatoes and stir fry for 1 min. 3) Add in mushroom soup and water. Stir well and add in cooked rice. Bring to boil. 4) Check seasoning and add in parsley. Dish out to a greased baking dish. 5) Sprinkle cheese on top and bake in a 350 degree F oven until top is brown and bubbly. Serve warm. Note : You can add other vegetables like cauliflower or broccoli to this dish. Gert ... the unbaked rice looks good enough to eat. :) It's like the easy "yat-wok-sook" (one pot ready) meals. Does the rice taste like fried rice? I'll try it for Monday Night Football. It sure looks good Gert... Add some broccoli pun sedap kan??? 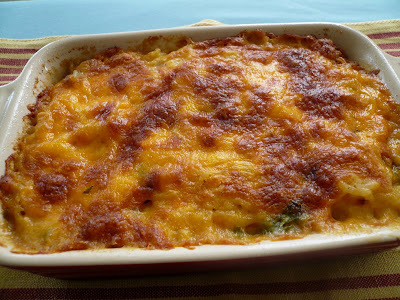 In the grocery store here, they have a dish name Rice & Broccoli with cheese - very similar to your dish here... Sedap. Rita, this dish is a bit like caserole. I like to make this on a lazy day. Do let me know if you like it or not. Beachover, I get bored with fried rice so I made this. Something different. Looks so delicious and lovely! hi, first time here reading your blog..wow you really have lots of time to bake. visit my blog, i bake too..
Deana e, thanks for stopping by. Will check our your blog. 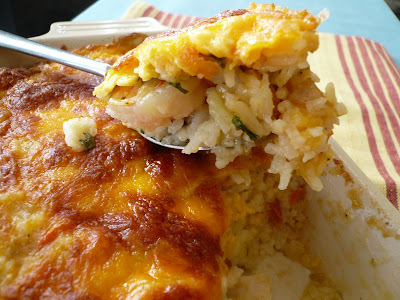 Gert, cheesy baked rice...very famous in those char chan teng here in KL. Really an easy dish to make too. Hi, I know this is a really old post but I just wanted you to know that I worship your blog. I'm a student living abroad for the first time so sometimes I get homesick for food that no one else has seemed to have heard of so this is just great! I made this and it was good although I sprinkled cheese into the rice too and mixed it up before putting some more to make a top layer so that it would be cheesy all the way through. Pinky, yea this is an easy dish to make. Ehon, hope you like this.